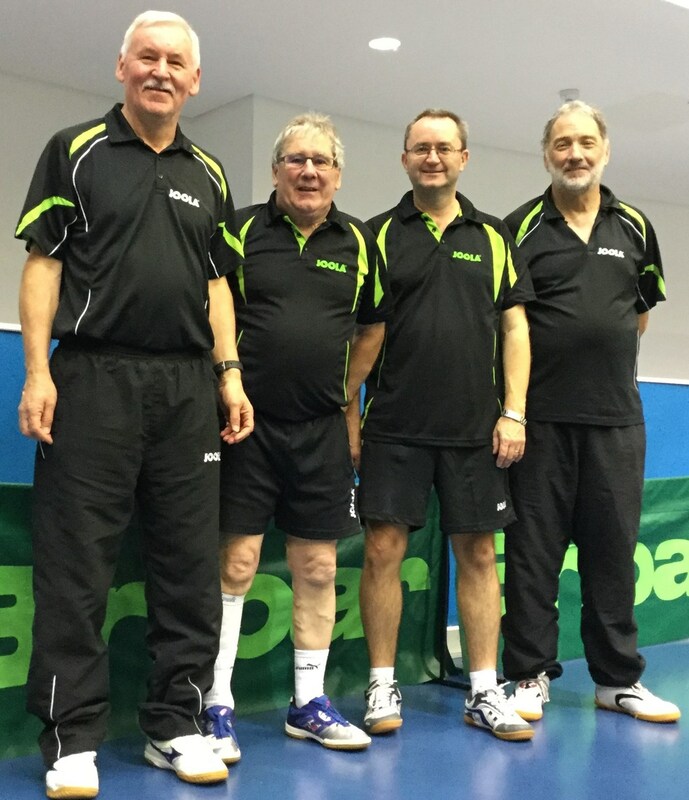 Cirencester Table Tennis Club are currently in 2nd place in Division 4a of the National Veterans British League at the halfway stage of the competition. The team which comprises of Dave Harvey, Ray Powell, Dave Adamson and Tom Watmore had some outstanding results on day 1 & 2 of the competition. First match was against Whitworth Academy where the first match saw Ray Powell come back from being 2 -0 down to win the next 3 games for a brilliant victory against Mike Bradbury, this win set the tone for the match with 2 wins each for Dave Harvey and Dave Adamson. The only defeat for Cirencester in that match was David Kelly beating Ray Powell in 3 games. Cirencester took the match by 5-1. The next match was against another strong side in Joola Plymouth, this was to be a real test as Plymouth had an ex National champion in Paul Giles playing in their team. Dave Harvey got the team off to a good start by beating Jeremy Williams 3-0, Powell lost to Giles 3-0, Adamson beat Mike Short 3-0, Harvey took the first game against Giles, this was the only game Giles lost all weekend but despite a good effort by Harvey, Giles ran out a 3-1 winner. Adamson lost to Williams 3-0 but Powell came back strongly to defeat Short 3-0 which tied the match result at 3-3 leaving both teams undefeated after 2 matches. The last match of day 1 was against Draycott 5, Tom Watmore was brought in due to a leg injury to Adamson. Harvey and Powell won their matches and Watmore picked up his first win before he lost to Anthony Brown 11-9 in the 5th game of their match. Overall a 5-1 win for Cirencester put the team in 2nd place after the 1st of the 4 days. Day 2 started really well for the team as Harvey, Powell and Adamson made short work of Ormesby by winning 6-0, 5 of these were won by a score of 3-0. Due to other results this put Cirencester on top of the league going into the final match of the first weekend. The last match was against Ashford who hadn’t won a match all weekend, Cirencester swopped Watmore for Adamson again. Ashford rose to the challenge and the first game was Harvey against the penholder Winston Wong, Wong played some inspired table tennis hitting shots past Harvey for fun and deservedly took a 2 -1 lead over Harvey, Wong lead 9-7 in the fourth only 2 points from a great victory but good positive play and mental strength from Harvey gave him the game by 11-9. The fifth and final leg was a tense game but Harvey maintained his composure to win by 11-8. Although they lost that match Ashford took great heart from it and Lopata was too strong for Powell and he won 3-0. Watmore against John Hope was a 5 set match with neither player being able to dominate and after a close match Hope won 11-9 in the 5thend. Harvey then brought Cirencester back level with a hard fought win 3-1 over Lopata. Watmore took the first game against Wong but couldn’t maintain the momentum and lost 3-1. The last match was Powell v Hope with Cirencester needing to win it to get a draw from the match. Powell seemed to have control in the first game but then some good play from Hope changed the momentum and Hope won the first game by 11- 8, Powell went behind in the 2nd game and lost that 11-9, the 3rd game also went to Hope for a surprise victory for Ashford by 4-2. The final weekend will take place at Derby Arena over the 23rd / 24th February 2019. Cirencester have 2 more matches to play in this league against Border Reivers 2 and Nailsworth Phoenix, after these matches have taken place the top 4 in the division will play each other again to determine which 2 teams are promoted and the bottom 4 teams will play each to determine the 2 teams which will be relegated out of the league. So 5 teams are fighting it out for the top 4 places.